The largest toad in the world calls the extreme south of Texas home. The cane toad (Rhinella marina), also known as giant toad, neo-tropical toad or marine toad, is a large land toad native in the Rio Grande Valley, south to Mexico and into Central and South America. Cane toads are in the Bufonidae family and are known as true toads. True toad characteristics include having warty skin, plump bodies and short legs. They have no teeth or breastbone. Most significantly, members of this family have a pair of parotoid glands on the back of their heads that contain toxins. The cane toad can reach to eight inches in length. In America, they are more likely to be close to seven inches. Still, in toad size, that’s huge. Toads are measured from tip of snout to base of tail bone. Lizards also are measured thusly. It is called snout-vent length (SVL). The tail on a lizard is not included in the measurement nor the stretched out legs of a toad or frog. In the wild, cane toads are opportunistic carnivores. They eat a wide variety of invertebrates and vertebrates, including insects, reptiles, rodents, other frogs and smaller R. marina toads. They also eat carrion and plants. They hunt by sight or by using their sense of smell. 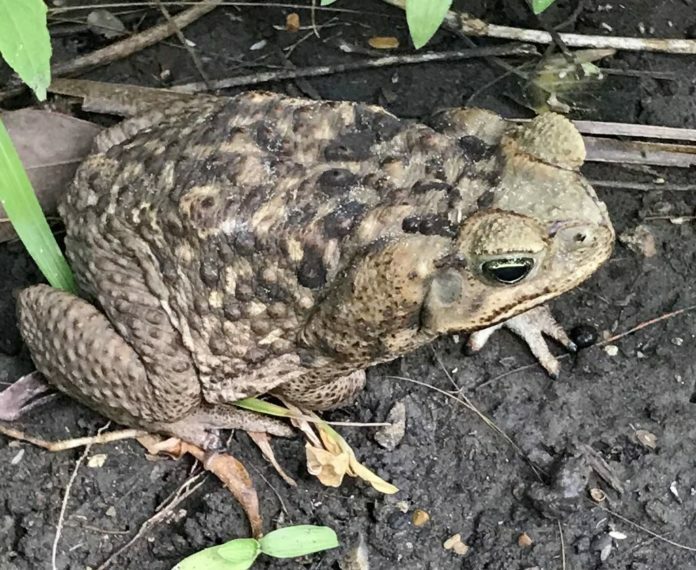 The giant toad living in urban areas will eat pet food that’s been left outdoors and household garbage, including carrot peelings, lettuce, cooked rice, rotting avocados and feces. They can live 10 or more years. The warts on a toad aren’t warts. The rough and bumpy skin, scientists believe, helps camouflage them from predators. However, a toad’s parotoid gland is something of which to be cautious, especially on the cane toad. The cane toad produces the strongest poison of all toads. Their large parotoid glands extend from just behind each eye and reach far down the sides of its body. The gland secretes a bufotoxin, which acts as neurotoxins, and can kill its predators and irritate human skin. Cane toads can shoot the poison 3 feet and more. If you hear a low-pitched, staccato trill sounding like a distant tractor, you might be listening to this interesting giant toad. Anita Westervelt is a Texas Master Naturalist and provides monthly articles to The Monitor.